There may be some in our audience that have worked with the Intel® IoT Developer Kit. These kit is based on off the shelf hardware like the Intel® Galileo Board, and a Grove Sensor Kit by Seeed Studios*. They work on Yocto* Project Linux and are great as an introduction to the world of IoT. There is a concept called Path to Product. You can imagine that if you have a rocky path to building a product that you will face a variety of obstacles in trying to reach a functional prototype phase in your product development. We introduced the Intel® IoT Commercial Developer Kit to help provide a smoother road. Where the Intel® IoT Commercial Developer kit differs is the software side. Yocto Project Linux is removed and Wind River Linux with Wind River Intelligent Device Platform (IDP) XT is put in place. 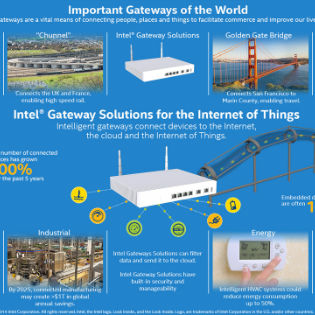 Beyond the powerful software, a key goal is accomplished which is a smooth transition from a proof of concept experience in the Intel® IoT Commercial Developer Kit to the Intel® Gateway and commercial level sensors needed in later product development phases. The Intel® IoT Commercial Developer Kit is perfect for entrepreneurs and developers with an eye on the future. The kit is integral in the proof of concept phase, so that it is easy to explore solution sets prior to choosing a path to product. Once you have perfected your problem solution, moving on to a Commercial IoT Gateway is simple with easy code compatibility and porting. Ideally the Intel® IoT Commercial Developer Kit should be used in the beginning stages of proof of concept development. Doing so early on cuts costs, and helps to quantify potential solutions early on prior to ramping up to a prototype, which can easily cost many times more to develop. The overall cost of the Commercial Developer Kit allows a workgroup to purchase multiple kits to develop in unison, and explore problems and solutions in parallel which as a result can cut development time significantly. Identifying constraints is an integral part of IoT development. From available networks, to battery power, to available sensors there is much work necessary to identify the environment that a product is to be placed, and then ensure that it is designed properly to function within those environmental constraints. The Intel® IoT Commercial Developer Kit is perfect for understanding how to solve a problem in the real world. Design your software, hook up your sensors and try it right in the field to evaluate. The Intel® IoT Commercial Developer Kit is designed to significantly help in the path to product process we all face. This low cost proof of concept solution opens many doors that previously took more expensive devices to fulfill. Use the Intel® IoT Commercial Developer Kit to jumpstart your development process and have a smooth road to your new product. You can Sign up to receive an email notification when the Intel® IoT Commercial Developer Kit will be available for purchase. How to Start with Internet of Things ( IoT ) ? which is the best external lens kit ? Which is the best HP Pavillion laptop with Intel i5 configuration for programmers? Which is the best laptop for an app developer?